Follow step-by-step, photo illustrated instructions to make these oven baked, crispy, barbecue chicken wings. We’re featuring Dimples BBQ Sauce, a North Carolina favorite out of Raleigh, North Carolina. It’s the perfect appetizer for family time around the TV on game day. Don’t forget to bring the napkins, you’re going to need them. Printable recipe included. The Giveaway portion of this post has ended. Thank You to everyone that entered. THE REVIEW: Sometime back, and actually further back than I’d like to admit, the fine folks over at Dimples BBQ Sauce in Raleigh, North Carolina, sent me some of their product to sample. They blessed me with a couple of 16oz. bottles of their BBQ Sauce and a few smaller sample type bottles as well. They of course hoped that I’d try it, maybe write something about my experience with it, then give one of the bottles away here on Taste of Southern. Just so you will know, I was not under obligation to them and they have not paid me for my opinions. The views expressed are entirely my own. Unless you live here in North Carolina, around South Carolina or Virginia, you may not be aware of just how MANY different BBQ Sauces are on the market today. It’s a tough business with lots of competition for shelf space. Like many around these parts, I make my own BBQ Sauce and I’m pretty proud of it. And as you may or may not know, North Carolina is divided between Eastern and Western as far as styles of BBQ Sauce go. We prefer a Vinegar Based here in the Eastern part of the state, while our Western friends prefer a tomato based version. In other words, we get serious about our BBQ Sauce. Super Serious. For the record, I make my own Vinegar Based Sauce and I also make a Tomato Based Sauce. I’ve won 1st place ribbons for both at our Regional Fair and I won 3rd place last year for my Tomato Based Sauce in the 2013 North Carolina State Fair. That really doesn’t prove anything, I just like to throw it in whenever I get the chance. Unless I’m talking about barbecue, I don’t really get the chance. Forgive me. I was really excited to get my package from Dimples. I jumped right into it of course and have been looking for a way to tell you about it here on Taste of Southern. There are lots of great ways you can use Dimples BBQ Sauce, or any barbecue sauce for that matter. It goes great on Beef, Chicken, Pork, even Pizza. I reckon Chicken is my all time meat-of-choice, so I decided to cook up a batch of chicken wings and take advantage of the bottles of sauce from the kind folks over at Dimples. I’ve got the recipe for you just below. 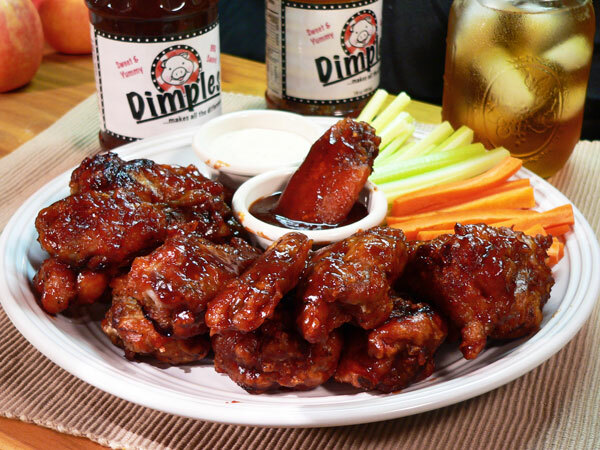 Dimples BBQ Sauce is a sweet, tangy, delicious sauce just right for chicken or beef. I’ll stick with the Vinegar Based sauce when it comes to making barbecue pork. But, that’s just me, you might like it, and I promise not to hold that against you. I was well pleased with adding this to my oven baked chicken wings recipe below. I can also imagine how good it would be on BBQ Beef Ribs, one of my favorites, especially when slathered in a rich, sweet, tomato based sauce. You know, the kind that takes a whole roll of paper towels to get through. The messier the better. Right? As mentioned, Dimples BBQ Sauce is sweet and a little tangy all at the same time. I really like that combination, and liked that it was neither runny thin, or so thick you couldn’t get it to pour out of the bottle. It was silky smooth in texture and poured gently from the bottle. It would hold up well as a basting sauce for chicken or beef on the grill in my opinion. I also liked that it wasn’t spicy hot with peppers. I have a tendency to be a bit sensitive to heat, and Dimples BBQ Sauce didn’t have any of that. I found it very pleasing to the taste buds and would highly recommend it to anyone. I’m just proud they call North Carolina home. You can learn more about the award winning Dimples BBQ Sauce by visiting their website HERE. They have a bit of history about their fairly new product, launched in 2011, and lots of other reviews for your consideration as well. They have a few recipes you might enjoy, and the best part of all is… you can ORDER their BBQ Sauce right from their website. That way, you don’t have to just take my word for it, you can actually try it yourself. I don’t know if they ship Internationally, but they will ship at least to the 48 contiguous states, maybe further. I’ve included my recipe for using the sauce below. I understand there’s some type of big ball game coming up in a few days and this would be a great appetizer to gather the family around the TV set with. This particular recipe takes a little extra time to prepare, but it’s well worth the effort and I know you’ll love it. 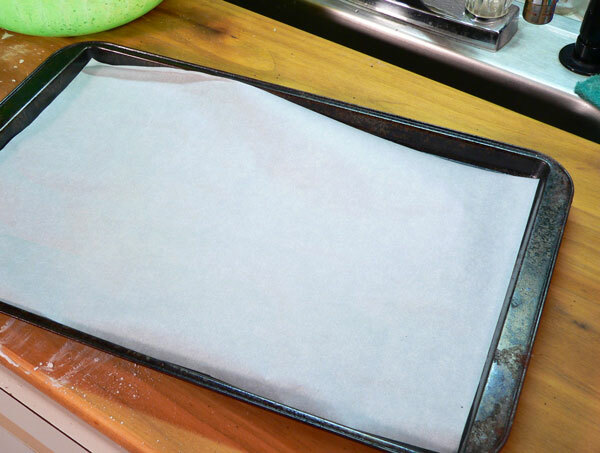 So, if you’re ready to give it a try, grab some paper towels and… Let’s Get Cooking! The Giveaway: We offered a bottle of Dimples BBQ Sauce to one lucky reader. They had to leave an answer to this question in the Comments Section below. One winner was chosen at random, from all the comments received. Thank You again to everyone that entered. 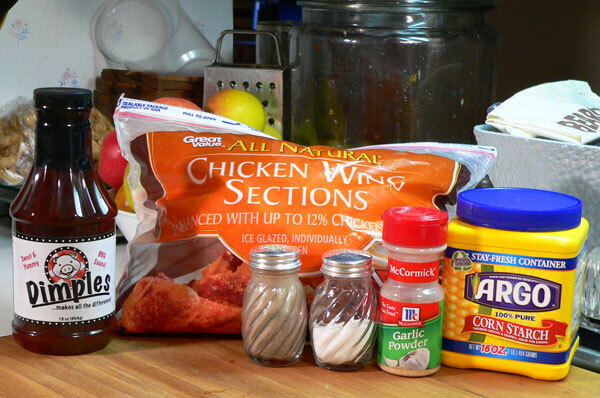 Dimples BBQ Chicken Wings Recipe: You’ll need these ingredients. 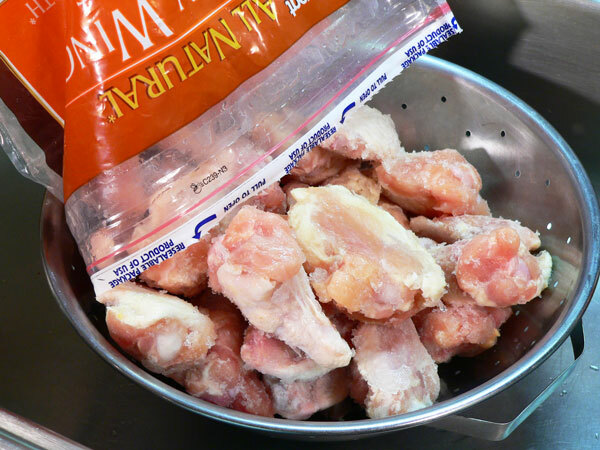 I’m using frozen chicken wings. I let them sit overnight in the refrigerator but they were still about frozen when I took them out. So, be sure to allow time for them to thaw properly. Here, I’m placing the wing sections in my colander. I want to rinse off the ice crystals and give them a quick check for pin feathers or anything else I might want to remove. Rinse the wings under cold running water. I must admit, I was a bit surprised by how many little feathers were still attached to these. Just use a paper towel to get a grip on them and they’ll pull right out. Rinse the wings well. Let them drain while you prepare the coating for them. 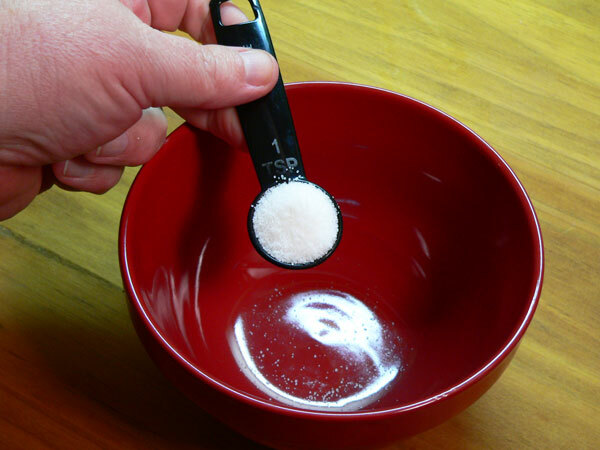 In a small mixing bowl, add the Salt. Add the Corn Starch. 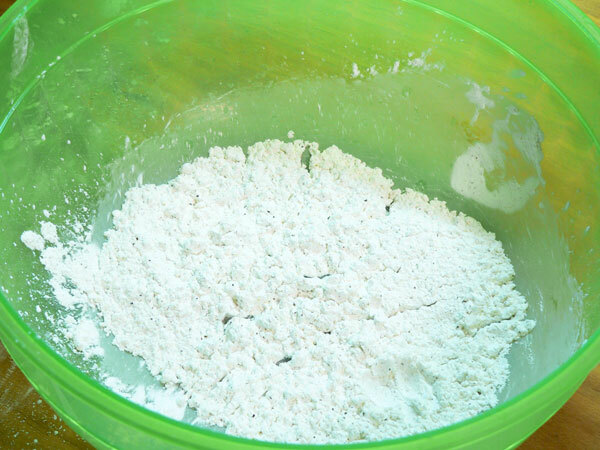 This is a great way to use up some of that big box of corn starch you’ve had sitting around in the cabinet all year. You’re suppose to refresh those items every once in awhile you know. 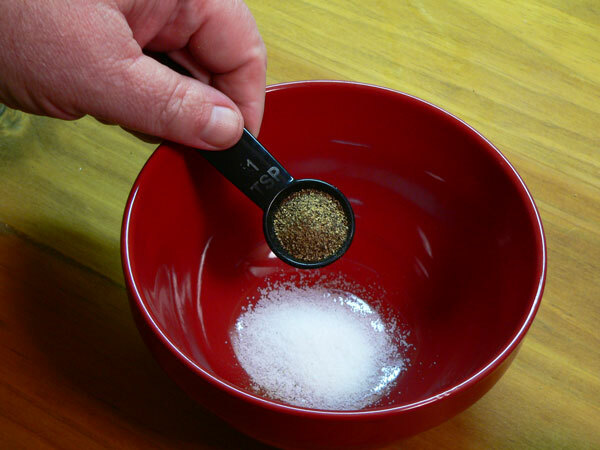 Use a fork and stir all the dry ingredients together. 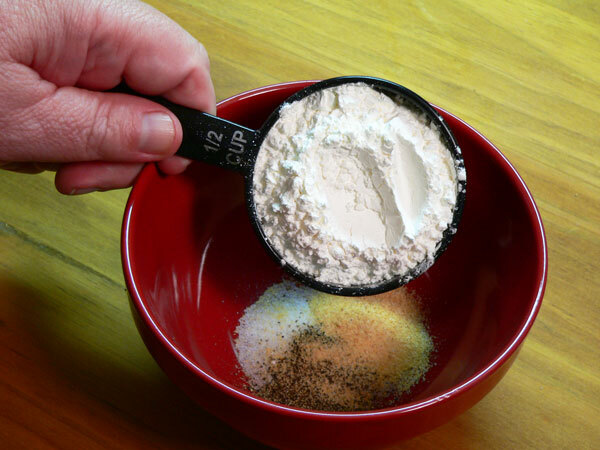 Place the mix in a plastic bag, or a paper bag. Most of the time, I use those leftover plastic bags that I bring home from the grocery store. Generally, I’ll ask for paper, but ever so often I take the plastic bags. I find they come in handy for wrapping up some items before tossing them into the kitchen garbage pail. That’s considered recycling… right? Now, give it a good shake to stir up the dry ingredients some more. 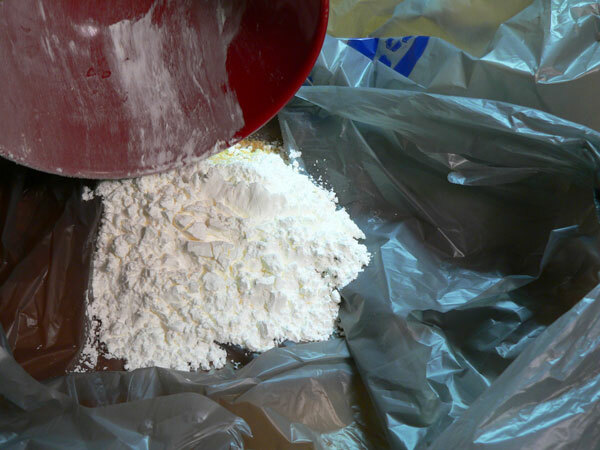 As soon as you discover the plastic bag has a HOLE in it, dump the dry mix into a larger mixing bowl. OK, I looked all inside the bag for holes before I added the corn starch mixture. Didn’t see a single one. Then, when I gave the bag a good hard shake or two, I covered my shirt with cornstarch, salt, black pepper and garlic powder. Seems there was a nice little hole in the side of the bag that I hadn’t seen. I didn’t have to admit to it, I just wanted you to be able to share in the “experience” of it all. I’m like that sometimes. You could use aluminum foil, or wire racks if you have them. The chicken wings don’t stick to the parchment paper as much as they normally do to aluminum foil. Just use what’s convenient for you. Working with a few wing sections at a time, place them in the dry mix and coat each piece. This would have been much easier in a bag, it’s just not as easy to get pictures that way. Coat each piece and shake off any excess. 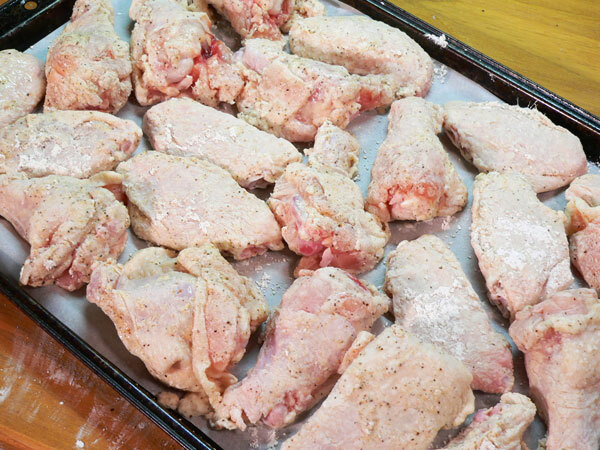 Place the chicken wings on the parchment paper lined sheet pan. Allow a little room between each one and don’t overcrowd them. You could go ahead and bake the wings at this point if you don’t have the time to refrigerate them overnight. But, we want them to be crispy, like fried wings, so in the refrigerator they go. Place the wings, uncovered, in the refrigerator and let them stay overnight. This will dry the skin out a bit and cause them to have a nice crispy skin once they are baked. The corn starch will also help give the wings a fried chicken like texture. Anytime you’re working with poultry, you want to be sure you aren’t cross contaminating any other foods you might have out. It’s best to just clear the counter and only work with the chicken until you’re finished. Then, make sure you wash anything that came in contact with the poultry in hot, soapy water, until you’ve got it all squeaky clean. I seem to have washed a LOT of dishes since I started Taste of Southern. Just saying. After 24 hours, remove the wings from the refrigerator. Just let them sit on your counter while you preheat the oven. You’ll want to bake them on 350º until they reach an internal temperature of 165º. Baking time will vary from oven to oven of course, so watch them carefully and don’t let them burn. Place the wings in the oven and let them bake for about 30 minutes. I had mine on the next to bottom rack. 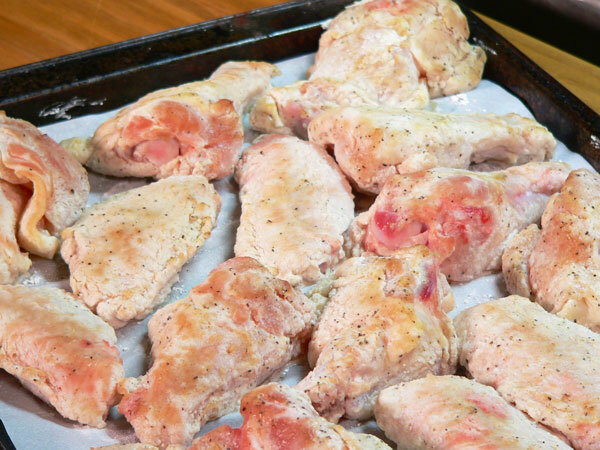 After 30 minutes, remove the pan and turn each wing section over. Then, place them back in the oven and let them bake until they are done. 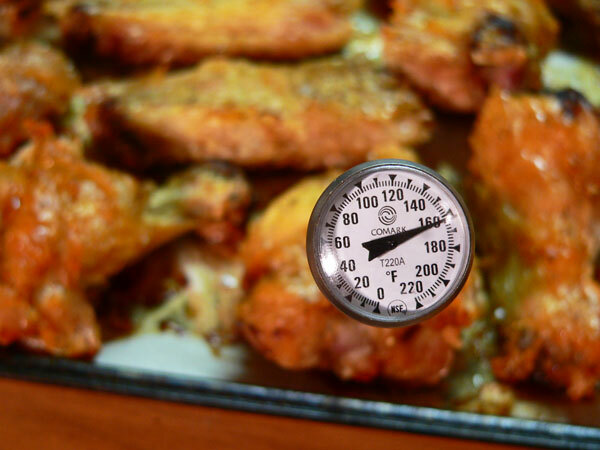 Let the wings bake until they reach an internal temperature of 165ºF. These were just about there at this point. A simple thermometer can be inserted into the thickest part of one of the drumettes to test for doneness. It took me well over an hour to bake these but the actual time will vary from one oven to the next. You’ll do well to purchase yourself a neat little thermometer if you don’t already have one. They’re generally less than $5.00 each and well worth the price in my opinion. My former days in the restaurant taught me to always use a thermometer and I can’t kick the habit now. Place the wings in a metal bowl if you have one. See how crispy they look. They are just like fried wings at this point and you might want to save out a few for anyone that might not like barbecue sauce. That is, if such said person even exists. Pour the Dimples BBQ Sauce right on top of the wings. Don’t be shy, lather them up good. 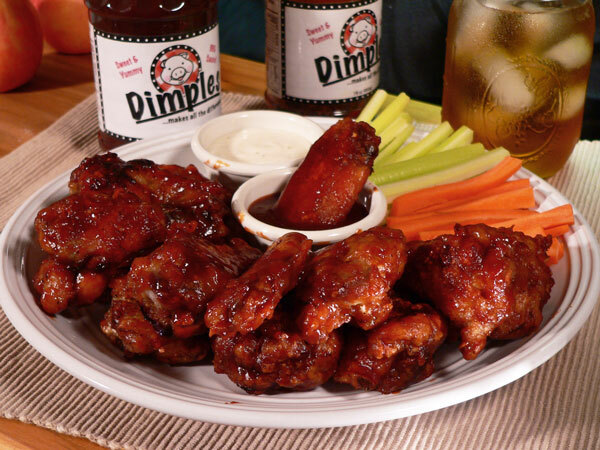 Toss the wings all around in the Dimples BBQ Sauce. Get them coated nice and good all over. This would be even more fun if you just stick your hand in there and swish them around. Just be sure no one is looking, cause you’re going to end up licking your fingers before you decide to rinse them off. I had to keep mine clean because of the camera. The things I do sometimes. If you aren’t serving them right away, wrap the bowl in aluminum foil. You can just sit it aside for about 15 minutes or so and let the Dimples BBQ Sauce flavor up the chicken. Or, you can pop the bowl and all, back in the oven and keep them warm awhile longer. They’ll just continue to get better and better. Important Disclaimer Technical Stuff that I’m required to tell you: Dimples BBQ Sauce supplied me with a couple of bottles of their sauce for review and giveaway. The opinions expressed in my review are my own and were not influenced by, nor was I paid for the review, by Dimples BBQ Sauce and their company. I appreciate you tuning in and listening. Follow step-by-step, photo illustrated instructions to make these oven baked, crispy, barbecue chicken wings. We’re featuring Dimples BBQ Sauce, a North Carolina favorite out of Raleigh, North Carolina. It’s the perfect appetizer for family time around the TV on game day. Don’t forget to bring the napkins, you’re going to need them. 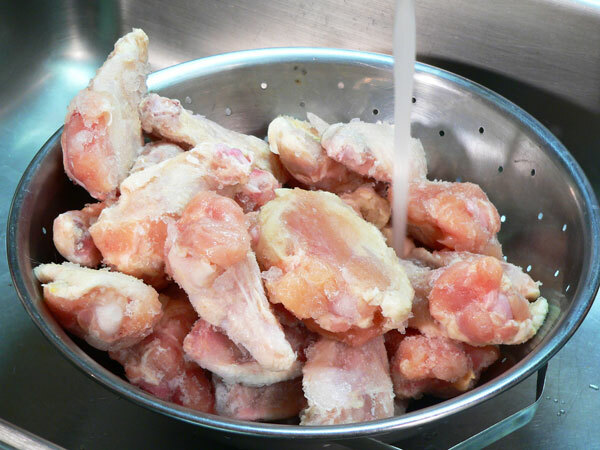 Rinse chicken wings under cold running water and let drain in a colander. 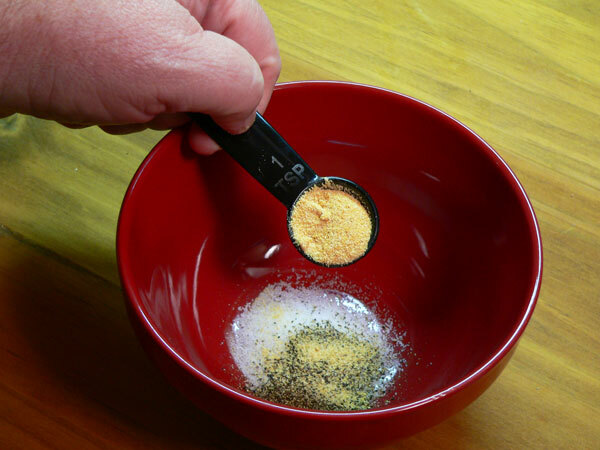 Stir well to mix the dry ingredients. Add the chicken wings, a few at a time, turning to coat the wings all over. Place the chicken wings in a single layer on the parchment paper, leaving space between each piece. Refrigerate, uncovered, overnight or for at least 8-12 hours if possible. 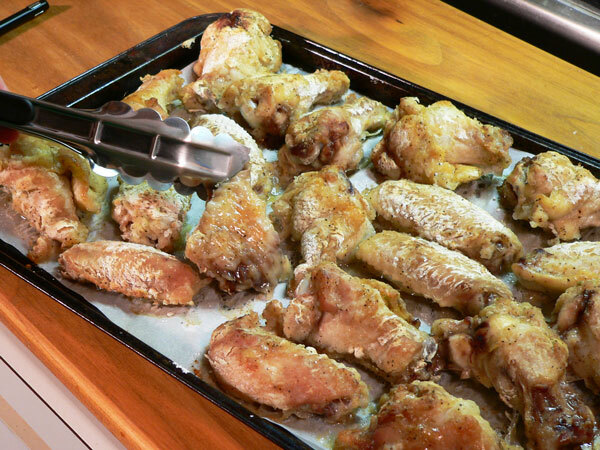 Bake wings for 30 minutes, then turn each wing section over on the baking sheet. 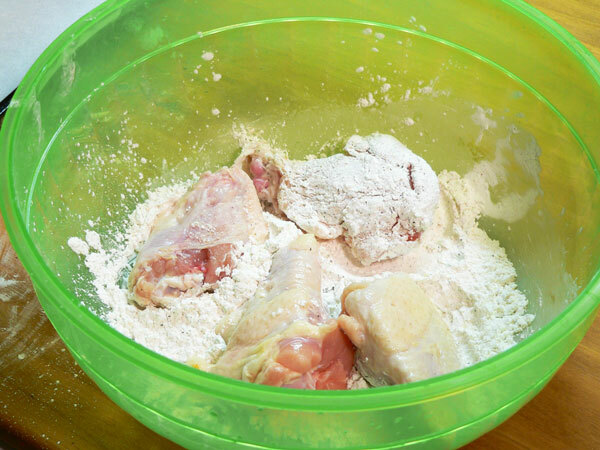 Place wings in a large mixing bowl. Top with Dimples BBQ Sauce. Shake well to coat evenly with BBQ Sauce. 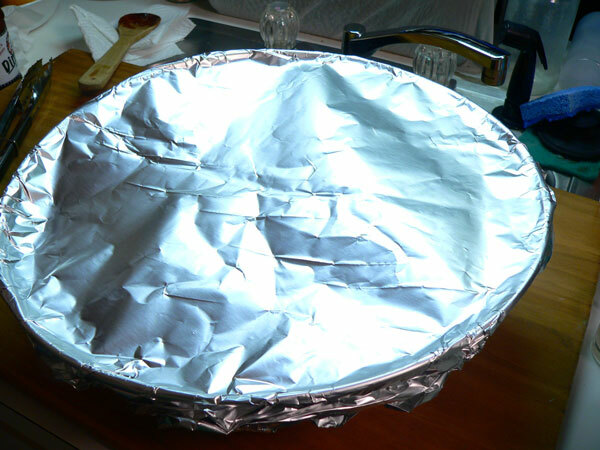 Cover with foil and let stand 15 minutes before serving. 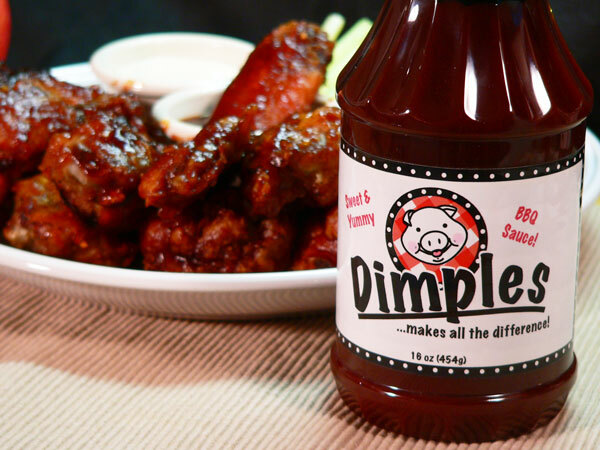 If you can’t find Dimples BBQ Sauce in your grocery store, substitute with a sweet barbecue sauce of your choice. Or, you can visit the Dimples website and order online. Your Comments: What’s your favorite way to enjoy Chicken Wings? Do you like them baked in the oven, or prepared outdoors on the grill? I’d love to hear your comments about our recipe. It will only take a couple of minutes to share your thoughts with us, and if you try our recipe, your comments might encourage someone else to give it a try. Just know that all comments are moderated. That just means that I personally read each and every one of them, before they are approved for our family friendly home here on the Internet. I also try to reply to as many comments as possible, so be sure to check back in a few days for that. Thank you in advance. Sign Up For Our FREE Newsletter: I try to send out a short Email each time we post a new recipe, or when anything else of interest is going on around Taste of Southern. It’s a great reminder of our latest recipes, news, giveaways and other such things so hopefully you’ll visit with us again. It’s easy to sign up and it’s absolutely FREE. Just fill out the information in the box below, or the box in the top right hand corner of each page of our site. Should you ever decide you’re no longer interested, it’s even easier to unsubscribe. I just hope you will never feel that way. So, sign up while you’re here, and I’ll look forward to seeing your name on our list real soon. I do hope you enjoy our site and that you’ll be willing to share our information with your family and friends. My wife got one of those new “air fryers”. It’s basically a convection oven. I have had problems in the past with the wings not getting crisp. Tried your method, overnight in the fridge and dredged in cornstarch. Yea!! Success. My husband and son are huge hot buffalo wing fans. I am going to make them THIS way. Much easier than dragging that nasty old, sticky deep fryer out. 🙂 Will let you know what they think! The daughter and I will have BBQ sauce on ours, Sweet Baby Rays, baby! I’ll have to order some Dimples! I just made this recipe and I can’t stop eating them. Fortunately, I’m alone for the weekend so they are all mine. This is now my go to recipe. Thanks so much. Did not use Dimples, but the sauce I had. Thanks for the recipe…I love making several different flavors and letting people pick their favs. Great recipe! I’m going to try it this weekend. I like to prepare mine super-hot, buffalo style. Never been a wing fan, but I think I became one when I saw the picture of the BBQ wings. They looked delicious! I love ALL wings, but I have to put buffalo first. By the way, I just saw an extremely funny documentary on the search for the world’s greatest buffalo wing: http://chickenwinghunt.com. Worth a watch! My favorite method for wings is to apply a rub, rest, bbq, and sauce. We usually grill the wings and add hot sauce (for grown ups) and BBQ sauce for teh kids. Yum! Like this recipe. Steve the best part of enjoying the hot hot hot wings is the sprouting of the tiny lava volcanoes on the top of the scalp under the canopy of hair and the tickle that is produced while erupting. The taste to me is secondary to the fun that is produced while eating wings, and anytime is best.. I like my wings buffalohot . Baked ( trying your season next time ) seasoned , Then coated in hot wings sauce. I do want to try Dimples Sauce. It just looks good on your wings. Plus you describe it so deliciously that it makes me want to try it. I make my chicken wings by first seasoning with salt, pepper, garlic and a little slap ya mama seasoning. Then flour and fry them. Meanwhile I make a sauce on the stove of honey, brown sugar, hot sauce and red pepper flakes. Once the wings are done I toss them in the sauce and pop them in the oven on 350 until they’re nice and sticky. Very yum! Steve, First let me say that I just made your pulled pork in the oven recipe and it was great! Had many good comments on it when my friends were eating it. 5 stars for that one. I like cooking wings on the grill best but when it’s -20 degrees here in Michigan you just don’t want to even go outside. I usually just sprinkle alot of garlic salt on them and grill them until done. Then I baste them with John Boy and Billy’s original BBQ sause. Very good this way. I would love to try some of this new Dimples sauce. PICK ME PLEASE!! Hi Steve! Looks delicious, and I would love to try Dimples! to be honest, though….I’ve never eaten wings! Now what kind of Southerner is that!? I’d love to try the buffalo style since we love spicy! Hi again Steve not sure if winners can be international but my favourite chicken is roasted us brits do a mean roast dinner! Currently got a shoulder of pork in for your pulled pork recipe can’t wait. Cheers, bring on the dimples! Hello from Montana Steve!! I may live in the Montana but I still love southern comfort food. I am a fried chicken gal but these look SOOO good. I love the fact that they are baked and not fried. I have recently found your website and love your recipes. Nothing compares to good old fashioned home cooked food. Thank you for all of the new recipes. I love wings most any. I am looking forward to trying your recipe using Dimples sauce if I can find it. Look forward to hearing from you again soon. These look so good! Can’t wait to try them. I wonder how many chicken feathers I’ve digested over the years! My favorite recipe for chicken wings is to bake them covered in parmesan cheese and served with blu cheese dressing. I think I could eat a ton of them. Stay warm. Wow, what an outstanding recipe. 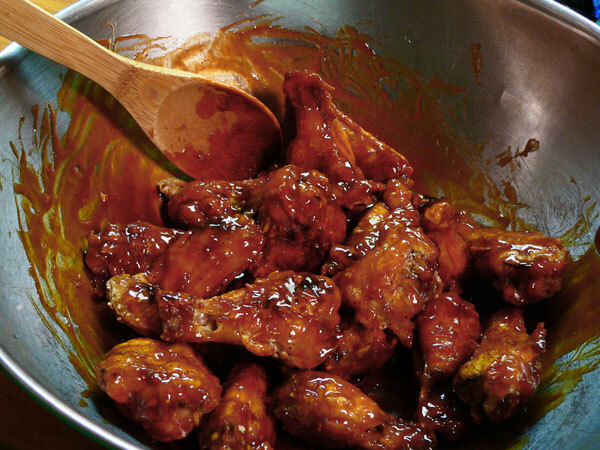 Most people just cover the wings in BBQ sauce, then bake, but you really went all out with such a delicious recipe. I especially liked how you prevented cross contamination in cleaning your utensils. All it takes is a little bacteria to cause a major health issue. …………oh, and a wonderful, prosperous, and Happy New Year to you! Love chicken wings. Baked, fried, buffalo sauced, teryaki sauced. Any way you can think of, but haven’t tried barbecue. Haven’t seen Dimples around her in GA.
Chicken wings have never been a favorite, but after looking at these pictures, I think they could become a favorite. They look yummy! Hi Steve, we like fried wings and buffalo wings. Your recipe looks so good, can’t wait to try it! Dimples BBQ Sauce sounds delicious. I like the combination of sweet and tangy. Thanks for another great recipe. on the charcoal grill for sure, using indirect heat, and using damp wood chips wrapped in foil, so they smoke and don’t flame up. then I coat them with buffalo sauce , then a second coat with barbeque sauce for a sweet- spicy- smokey flavor. have a great day and enjoy. Wings are good any way you fix them! We like them fried or baked; plain, buffalo (Texas Pete as others note), homemade Asian sauce. We’ve never had them with BBQ sauce so I will try Dimples out – especially since it is a sweet and spicy sauce (love spicy!). Sounds like it will be great on ribs, too. 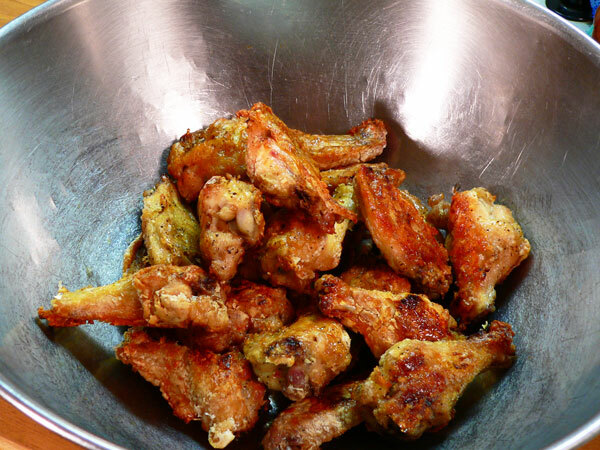 Thanks for sharing your recipe for crispy baked wings! I can’t wait to try that – usually when I bake them, they just do not get as crispy as a wing should! 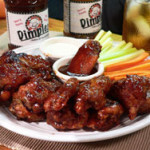 I don’t care for chicken wings, but would love to try Dimples on pork chops! I almost always have two batches of wings, 1 batch that’s smoking hot to tease the buds and 1 batch to calm them down a little. Dimples will do perfect for the milder wings. Also not just for wings, it’d be great for chicken strips too my friend! Buffalo wings are my favorite. Looking forward to trying this recipe and hopefully winning a bottle of Dimples. We southerners like wings any way we can get them as long as they are GOOD!!! Fried with Texas Pete the best! Looks like a winner. Can’t wait to try them! Love the Dimples Pig on the label – too cute. I love wings, BBQ, honey glazed, mild Buffalo (which I actually ate in Buffalo decades ago before they became a national craze). Found as I got older, I couldn’t eat the hot wings, dang age! Your recipe makes me hungry. They look great. I love barbeque wings. There are so many bbq sauces on the shelf for sale. It is hard to pick one sometimes. I have not seen Dimples in our stores. Looking forward to trying it if I can find it. Thanks for all the great recipes. Can’t wait to try these. As I love bbq wings. Anxious to try this. But I do not have this sauce where I live. Will find something close to it. I make our wings from boneless chicken tenders and bake them. We like them very spicy. I can’t wait to try your recipe…sounds like it will make them nice and crispy. Honestly, I never saw the excitement of the chicken wing. Maybe I just need to be shown the light, but seems like theres a lot of work involved for that little bit of meat! I have never made a batch of just wings. HOWEVER, I do LOVE bbq, & esp bbq chicken when it involves all other 7 of the meaty size pieces. We dont have Dimples here, but it really is super cute ! Anyway thats my 2 cents…maybe I will try to persuade myself to do wings so I can see what the fuss is all about. Obviously, I must be missing something here as everyone else seems to love them. Lolz. Thanks for the recipes & have a great weekend! The “wings” of choice at our house are deep fried with a sauce of Texas Pete and Butter with a bit of garlic powder added. I agree with you, the “Dimples” sauce would be WONDERFUL on ribs!!! I like them a little hot and spicy not real hot. I always fix the BBQ ones for the grandchildren. We will be having them for the super bowl thanks for the recipe. Hi Steve! Your play by play recipes are a GOD SEND! 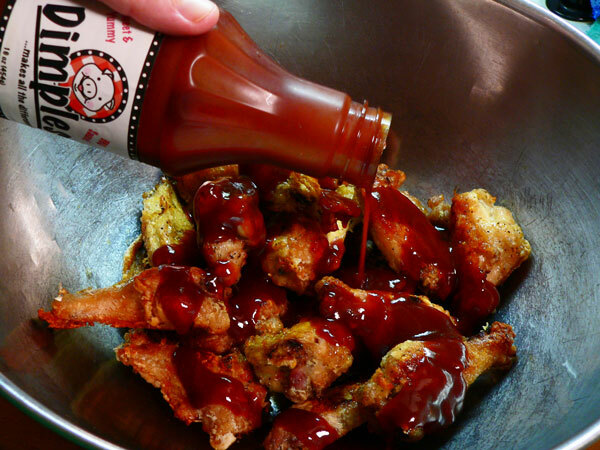 My favorite recipe for chicken wings is baking them and coating them with a sweet/hot sauce, one I usually have to make myself. I would love to try Dimples! I bet I would never have to make my own again! Glad you arrived home safe last evening. Stay warm! Cheers! The wings of choice in our house are a copycat of “Hooters” wings. Fried with a Texas Pete/Butter sauce, and of course Blue Cheese for dipping. I agree with you, sounds as if “Dimples” would be awesome on ribs!!! I’m a fried chicken wing fan. In fact, the chicken wing is my favorite piece of the bird. Time Out Restaurant in Chapel Hill used to have the best fried chicken in the world and had a lunch special with 3 wings and 2 sides (all homemade). That was my go-to when I worked across the street and didn’t bring lunch. I like to bake them as well, and I use the same method as you. Have you every tried saucing them with a mixture of jelly pepper and a touch of lime? I like to smoke wings on my Cookshack smoker. I then give them a quick dip in hot oil to crisp them. I usually cover them with a buffalo sauce which is my favorite. These look delicious though. I’ve been eyeing the Dimples sauce lately. My mom’s name is Dimple and the sauce came up on a barbeque forum so it caught my attention. I plan to order some online since I don’t live in NC. I’m partial to the medium-hot buffalo wings, but also like the same wings with an Asian-chili sauce that’s made by Franks Red Hot. To be honest, I’m not sure there’s any bad way to have chicken wings. With the Super Bowl on its way, this was perfect timing. I like how this recipe makes baked wings rather than fried. My personal favorite wings are spicy and crispy from the oven. I normally use Frank’s Red Hot sauce as we don’t have Dimples where I live, but I would love to try it. Thanks for the recipe. I will certainly give it a go as soon as I can. Your recipe looks delicious! I really prefer boneless wings, or even the little drumettes. As always, keep the recipes coming!